Here’s a great photo that was found in an antique store in Dearborn, Michigan, showing a man (thirty-something?) 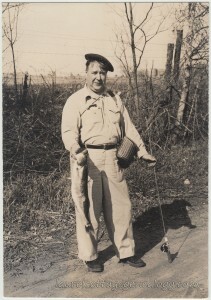 dressed in khaki shirt and pants, wearing a beret, and posing for the camera, with fishing pole, wicker basket and holding a pretty good-sized fish. It’s late morning one would think; he’s smiling and squinting a little in the sun. He stands at the edge of a dirt road out in the country somewhere; there’s a barbed-wife fence behind him and some farm buildings off in the distance. 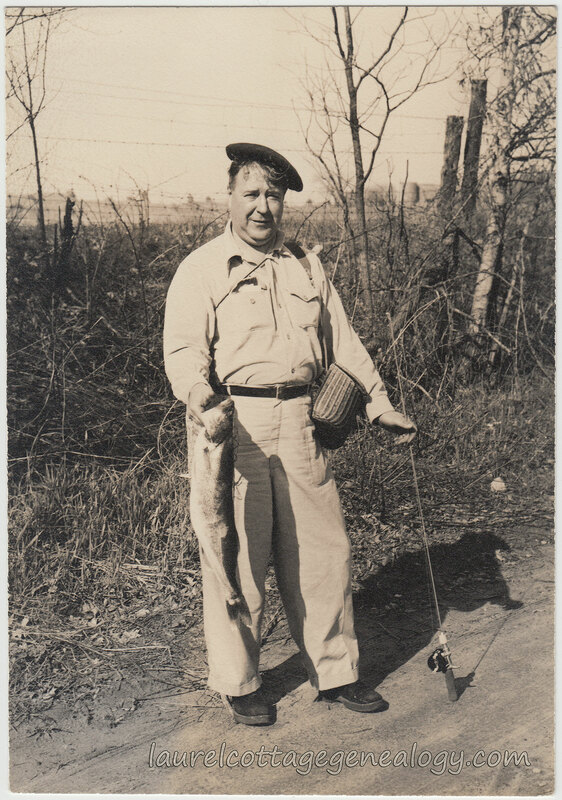 Probably the best way to get a good idea of the age of this photo would be by researching the style of fishing pole. Maybe we’ll get some comments on this at some point in the future, but I’m guessing the photo might have been taken in the 1950s or early ’60s.